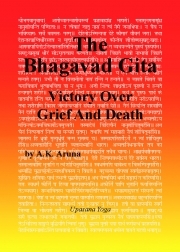 Description of "The Bhagavad Gita"
The Bhagavad Gita: Victory Over Grief and Death is a traditional translation using modern English. It follows the original understanding of these verses at the time of the Bhagavad Gita’s composition as being based upon the Upaniṣad scriptures. In this way, the presentation of the Bhagavad Gita matches the author’s presentation of Patanjali Yoga Sutras: Translation and Commentary in the Light of Vedanta Scripture. Together, they provide yoga teachers and students with a consistent, thorough grounding of yoga in the sacred spiritual heritage within the Bhagavad Gita and the Yoga Sutras. The Bhagavad Gita is intended for repeated reading. Its teaching is very subtle and integrates the core of oneself into the vastness of this universe of experience. Being transformative in re-envisioning oneself and the world, more depth and interconnectedness can be discovered with each repeated reading. The special format of the English translation of the Bhagavad Gita, using bold for original text and regular font for minimal contextual explanation, presents a way to quickly read the intended meanings of the entire text in three or four sittings. If one wishes the full Devanagari text, word-for-word meanings, and complete grammatical and syntactical analysis, please refer to author's The Aruna Sanskrit Language Series, especially the fifth book titled, The Bhagavad Gita Sanskrit Key: Verse-by-Verse Grammar & Vocabulary. Brief introductions are given to the entire Bhagavad Gita and to each chapter. These set up the following teaching and connect the teaching to what has been said before and what will be said later. This facilitates a quick integrated understanding of the teaching as you read. Additionally, a unique index is provided to locate the important terms, concepts, and topics. The uniqueness here is that the index is not to page numbers, but rather to chapter.verse numbers. This allows the index here to be applicable and very useful to any other translation of the Bhagavad Gita that you have relied upon but lacked an index. Reviews of "The Bhagavad Gita"